This BAGGO Trucker Mesh patch hat is made in the USA right here at BAGGO! 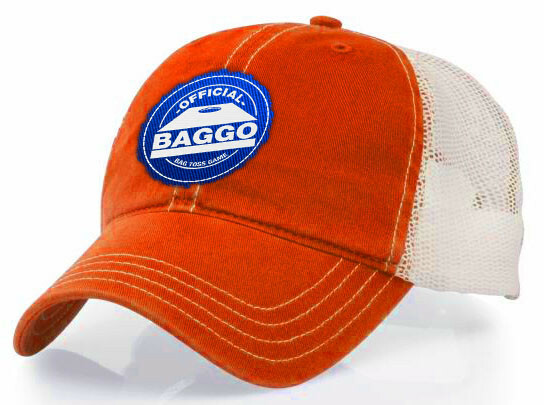 Patches are made using recycled bean bag fabric for a true "BAGGO" Hat. Adjustable back strap, one size fits most. Garment washed, Cotton twill front panels and visor with nylon mesh back panels. Contrast colored crown seam taping. Relaxed, contoured crown shape, Heavy double decorative crown and visor stitching with Pre-curved PE visor. Adjustable Snap Closure. Customization takes 2 - 3 business days as these are made to order. Please count this extra delivery time in your order time frame. Grab a BAGGO Trucker mesh patch hat in your favorite team color. Hats are custom made to order. Select your Hat color & Patch color. You patch fabric will be made using a recycled BAGGO bean bag to give a unique BAGGO style hat. Wear it on game day or any day. Ships in 2 - 3 business days.